Display Lighting is a leading UK manufacturer and supplier of specialist cabinet lighting designed for installation into all types of showcases and cabinets. Display Lighting has developed new and exciting ranges of LED luminaires that have been designed to be easy to install and cost effective. Lighting cabinets is a speciality field, requiring the focus to be on the products on display, with perfect light levels and sparkle. 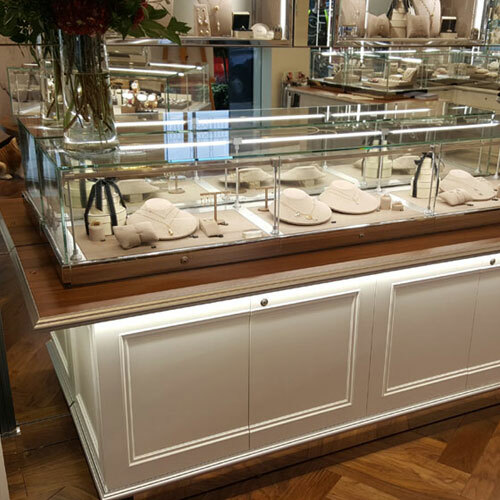 Display Lighting have been supplying the leading high street jewellers, museums, department stores and duty free stores with specialist cabinet lighting for over 13 years. Clients include Beaverbrooks, Royal Armouries, Alexander McQueen.